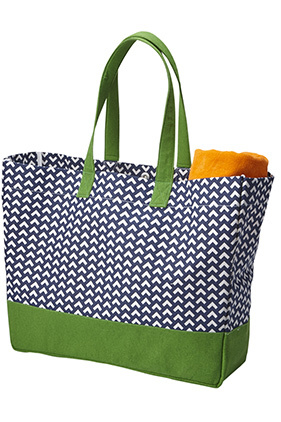 100% cotton canvas, 16 ounce patterned beach tote. Water repellent treated. 28" contrasting reinforced cotton canvas handles, 11" drop. Main compartment with snap closure. Interior hanging zip pocket. Interior mobile pocket. Two interior side pockets. Interior key ring loop.